In New York, Support Grows For Keeping Teens Out Of Adult Prisons Hundreds of 16- and 17-year-olds are serving time in New York's adult prisons, including Rikers Island. A new proposal would raise the age of criminal responsibility to 18. 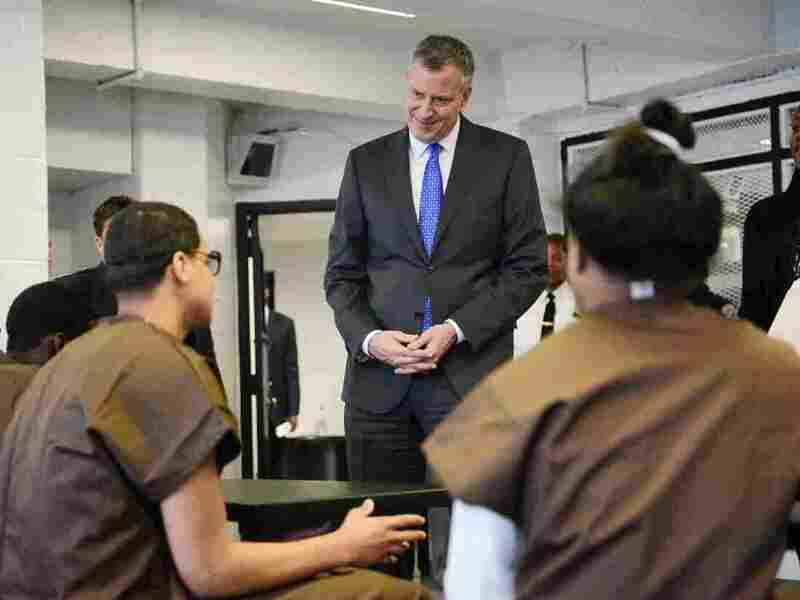 In December, New York Mayor Bill de Blasio met with youth offenders at alternative housing on Rikers Island. A new state proposal would spare teens younger than 18 from serving time in adult prisons. When Charles Nuñez was 17 years old, he was arrested in New York for carrying a handgun that he says he was trying to sell in Harlem. As state law requires, he was prosecuted as an adult and sent to Rikers Island, New York City's notorious prison, where he says he was quickly targeted by older men who wanted to steal his boots and his commissary money. "One night, when we were locking in to go to sleep, some dude just hit me while I was walking toward my cell," Nuñez says. "He basically ... knocked me out, because I, like, blacked out." Nuñez says he wound up in prison fights again and again. Anjelique Waddington, now a receptionist at a construction company and a prison reform activist, tells a similar story. She was 17 when she was busted in 2004 for selling drugs on Long Island. She, too, was prosecuted as an adult and spent the next year and a half in state women's prisons. "I had to become violent, I had to become evil," Waddington says. "I had to become an inmate. I became a statistic, you know, what they wanted me to become [in] the system." State officials say there are currently around 800 16- and 17-year-olds serving time in New York's adult prisons. But support is growing for legislation that would raise the state's age of criminal responsibility and would remove these teenagers from adult prisons. North Carolina is the only other state that still routinely prosecutes younger teens as adults and locks them up alongside regular inmates. Last January, in his State of the State address, New York's Democratic Gov. Andrew Cuomo announced a push to end the practice. "This is one of those issues that has gone on for a long, long time without resolution," he said, "and an issue, frankly, where we have done a lot of damage in the meantime." Earlier this month, New York Assembly Speaker Carl Heastie, also a Democrat, signed on, inserting the reform plan into his proposed budget. Under the proposal, the regular age of criminal responsibility would be raised to 18 and most younger offenders would be handled in family courts. Heastie says prosecutors would still have leeway to charge teenagers as adults in rare cases, when they're accused of what he described as "the most serious violent crimes." Last week, Cuomo posted a video on Youtube showing support for the reform plan from prosecutors, sheriffs and police — including Westchester County District Attorney Janet DiFiore and Albany Police Chief Steve Krokoff. In the past, prison and criminal justice reform proposals have been blocked by New York's Republican-controlled State Senate, often with the backing of prosecutors and the state's prison guard union. But those groups have stayed on the sidelines in this debate so far. Meanwhile, Betty Little, a key Republican lawmaker whose upstate district includes a cluster of state and federal prisons, has endorsed Cuomo's proposal. She has described locking up 16- and 17-year-olds in adult prisons as "unproductive." Charles Nuñez, now 25, says he was eventually allowed to join a alternative-to-prison program for juveniles — and this eventually helped him graduate from college. "They gave me the opportunity to get into internships," says Nuñez, who is applying to law schools and serves as a community advocate with Youth Represent, an advocacy organization in New York. "They gave me job training skills. Unfortunately for me, I had to get into the criminal justice system in order to get into that program." If this bill makes it through the legislature, as many as 1,600 teens would be diverted each year into similar programs — meaning far fewer 16- and 17-year-olds will be saddled with permanent criminal records. One lingering concern is how these new programs would be paid for. Local government leaders issued a statement this month saying they back Cuomo's proposal. But they don't want to be stuck with the bill.